Zzzquil, the shining example of what happens when you make PR decisions while sleepwalking. Adult website Pornhub (yes, it has a Twitter) pathetically attempts to show tolerance. Though well-intentioned, it may have not been the smartest move for PETA to equate the struggle for human rights with a sad animal. Forever 21 shows how important it is to make a statement by protecting your smartphone. You shouldn't have, Krazy Glue. Really, you shouldn't have. How long did Chicken of the Sea spend Googling this? Put your silly hat back on, Arby's. McDonald's shows it knows how to follow Title VII of the Civil Rights Act of 1964. Coke shamelessly attempts to demonstrate what it's like at the mountaintop. 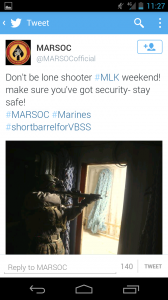 The U.S. Marine Corps should have thought first before kicking off the three-day weekend, guns blazing (H/T: @athertonKD).